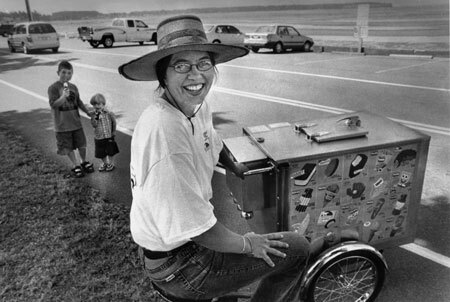 Our mobile Birch Bay ice cream vendor Shelley Winder-Yost loves to make people happy and find ways to be involved in her new community. This Irish and Dutch lady is a former Peace Corps volunteer in Thailand and moved to The Peace Arch City from West Seattle last summer. Her husband John and sons Caleb and Eli create her loving family and have shared this latest journey from big city to small town. Shelley and John are local school teachers. Shelley isn't working now but will return to the classroom when Eli can attend school and not need his mother full time. Besides this mobile "happiness on a stick" ice cream business our totally giving husband and wife team are also Cub Scout leaders in their spare moments. Whether it is in their community service work or their roles as parents and teachers, they both want the best for the people whose lives they touch. John is from German, Irish and Scottish background and hails from Ohio. Both Shelley and John see God as a big part of their lives but not in a traditional church going manner. Quite possibly God could be seen in the smiling faces of folks selling and eating ice cream on July 4th.